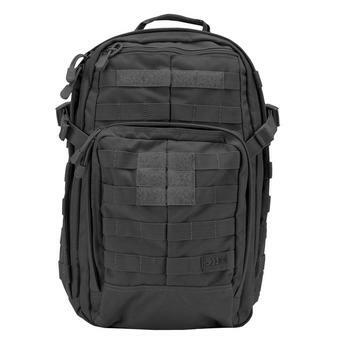 I’ve come to realize that the best backpack for military category diverges significantly from its regular cousin, the spacious bags built for your daily commute to school or work. They’re engineered to match an area of the market normally reserved for outdoor enthusiasts and hunters. 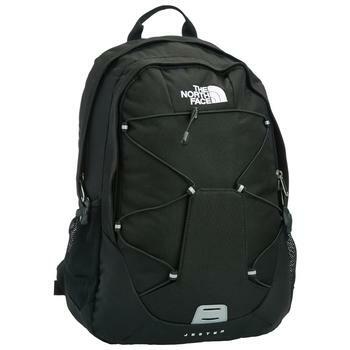 The armed forces and law enforcement agencies also seek out backpacks of this caliber. Among all, it’s the 5.11 Rush 12 backpack that’s making some of the biggest waves in backpack reviews of this class. 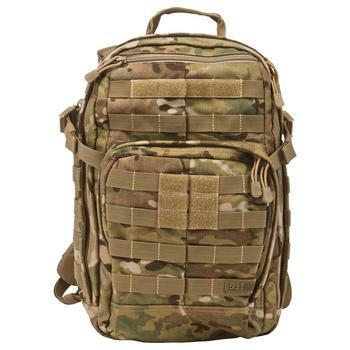 Regarded as one of the best backpacks designed for military use, what does it have to offer? Let’s find out. While the bag is designed to be a multipurpose entrant into the realm of backpacks, and it could serve as a traditional bag for commuting, I feel its potential would be markedly stunted by serving as a simple carrier. This is a high-performance backpack designed for high-performance individuals. Just to clarify, if you’re isolated from food and water for days at a time, engaged in challenging situations where you’re required to climb impossible precipices, this bag will serve you well. It’s made from a strong weave of water-resistant nylon, a tough fabric with a 1050D rating. The color of the fabric is a boring matte black, but this works well for practical applications, providing tactical camouflage while looking for concealment. No hunter worth his reputation wants to shrug into a gaudily covered backpack. Returning to the multipurpose aspect of the 5.11 Rush 12, backpack reviews typically focus on versatility and adjustment features, but this bag takes the notion to an entirely new level. 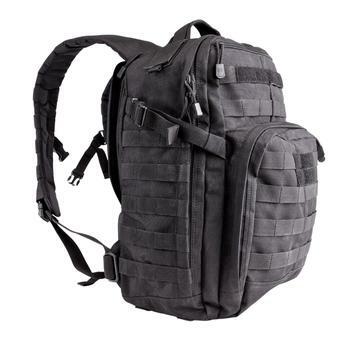 The configuration can adjust the interior to act as a tactical assault bundle or as a survivalist kit, as a law enforcement pack or as a backpack purely intended for hunting in the wilderness. The following points underline the backpacks clear intention to be considered in the category of best military backpack. Sixteen sized pockets and compartments deliver exacting storage options, meaning a consumer could conceivably own more than one bag and assign each one alternate roles. 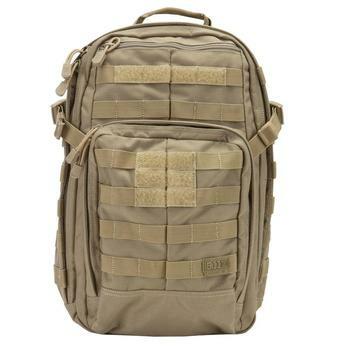 For example, a law officer could configure a first bag as an active assault pack and customize the second for weekend hiking. The build of the bag easily supports heavy camping equipment and armaments as stored by a hunter or member of a military organization. 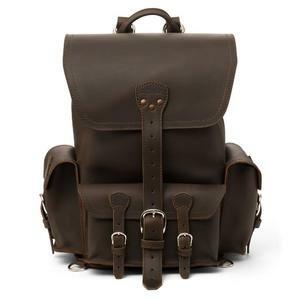 The heavy weight distributes nicely, and I notice the rugged outline of the backpack stays in place against my back thanks to a comprehensive arrangement of shoulder straps and a handy sternum strap. All of these harnesses are adjustable and comfortable, but the addition of two compression straps to the actual backpack is a logical addition. They secure loose belongings and lower the profile of the backpack even more, a big feature if the bag is being used for tactical applications. Backpack reviews in this category require a rigorous list of features, and the 5.11 Rush 12 answers this requirement and then some. An internal admin panel features prominently, as does the 60-oz hydration pocket, keeping you on-the-go when the terrain gets tough and your provision are low. The roomy interior has a 1296-cubic inch capacity, that’s 18″ x 11″ x 6.5″ of pure storage in the main compartment. 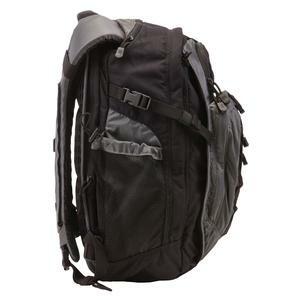 Another check in the box that rockets this bag into the rarefied heights of best military backpack is the solid zips securing the outside, each managed by an over-sized zipper tag for those whose hands are enclosed in thick gloves. Add a fleece-lined eyewear pocket, a wrap-around web platform that’s Molle and SlickStick compatible, and you have the ideal companion for an outdoor adventure. The 5.11 Rush 12 is deserving of attention when looking for a product capable of storing essential gear for military field operations and hunting expeditions. The brand 5.11 is not the ordinary name when it comes to backpack. But it is a name that has been trusted for years by those looking for tactical gears. From the materials to the detailed design of the 5.11 Rush 12. 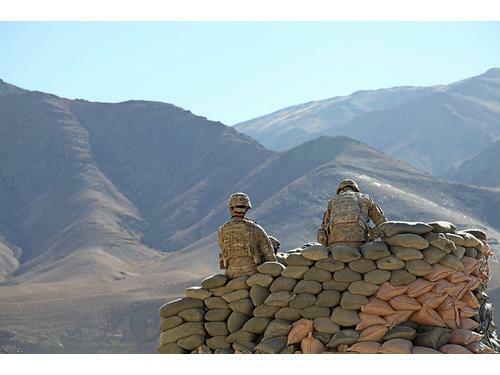 It is evident that this backpack has been built to meet the exact needs and rigorous challenges that are common by those who often find themselves in the battlefield.